Sukhoi demonstrates its new fighter jet, the Su-35, at a presentation near Moscow – and potential buyers couldn’t help but applaud. 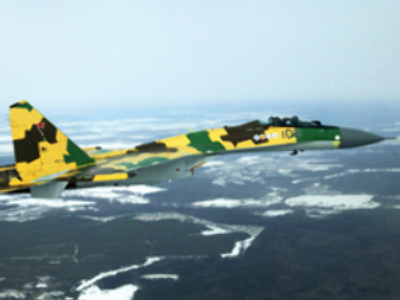 Russian fighter maker Sukhoi hoped to impress military officials from Venezuela, Malaysia and China not only with the abilities of its new aircraft, but also by its price. The price of this jet is highly competitive. We believe it’s the best offer on the market in terms of cost effectiveness. This jet combined best technologies of the fourth generation of fighter jets and is a platform for building jets of the next generation. Experts estimate the price of the new Su- 35 at around 65 million dollars and predict strong demand. Its ancestor, the Su-27, has sold well in Asia and Africa. Sukhoi says its in talks with China, while Venezuela, Malaysia and Libya are also possible future buyers. Sukhoi is offering the Su-35 in a tender to supply up to 120 new fighters to Brazil, against competition from four other aerospace firms. Dmitry Vasiliev of 'Military Export' Magazine says its the best available on the international market. In terms of technology the new jet is second only to the American fifth generation F22 Raptor. But the American jet was primarily for domestic use and not for export, leaving the SU 35 as the most cutting edge fighter jet available on the market. Last year Russian exports of military jets totalled $US 7.5 billion, while civil aircraft sales are still just a fraction of that figure. Sukhoi is now diversifying its business, starting production of its Superjet regional airliner, which is lagging behind schedule. Due to delays its main client – Russian carrier Aeroflot was forced to hire foreign regional jets before the Superjet’s first deliveries. The firm will have to repeat the success its military designs have enjoyed, if it wants to win airline customers abroad.